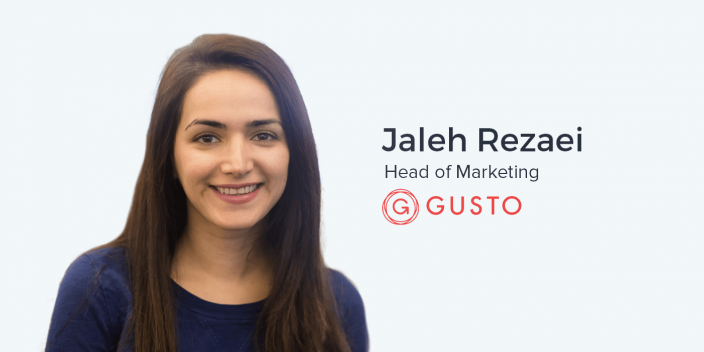 Jaleh Razaei is the Head of Marketing at Gusto, formerly known as ZenPayroll, a company that helps thousands of small businesses pay their employees. Prior to joining ZenPayroll, Jaleh worked as an analyst at Sequoia Capital followed by time as Director of Product Marketing at VMware to launch their employee productivity suite. There’s no doubt that it’s important to be marketing towards the primary stakeholder and person with the purchasing power. However, it’s also important to target and craft messaging around the needs of other stakeholders or influencers close to the target customer. And don’t just think about your buyer but who are the influencers or the folks that touch that product or need to interact with the product, and how can you give them an experience that’s really valuable and indispensable. Many modern marketers, especially technical professionals empowered by the vast amounts of data, find the value of a quality brand difficult to measure. At the very least, quantifying brand equity can be a abstract and uncertain process. One way to evaluate the effect of a brand is a Net Promoter Score, also known as NPS. a good brand just means that you have customers who love you, who can’t live without your product, and who are advocating for you, and they have this emotional connection with your brand. And you actually can measure that. You can measure NPS, you can measure your word of mouth and virality. NPS has multiple benefits, but it can also help you understand your company relative to your industry segmented by different types of users and the high-level direction custom satisfaction is headed. As powerful as digital advertising has become, successfully scaling your paid acquisition can be challenging as you expand your audiences and advertising platforms. Why is it that paid acquisition ends up being a small portion of our overall customer acquisition mix? It’s because it gets really hard to scale paid acquisition. As you keep growing, you have to expand and go to channels that become less and less cost-effective...as you start to scale, you now have to go up the funnel to folks who are perhaps, you know, not ready to make a switch. However, this doesn’t mean that it’s not incredibly powerful. A potential framework for understanding and addressing this challenge is the See-Think-Do-Care methodology to help you evaluate when, where, and how to invest your digital advertising budget. Ander: So I am continually impressed and amazed as I’m going around San Francisco talking to marketing leaders elsewhere from the companies of a lot of the products that we actually use at Instapage. Gusto is one of those products just around the corner from Instapage HQ in San Francisco and here I am today at Gusto HQ with their Head of Marketing, Jaleh. Jaleh, how are you doing? Jaleh: I’m doing great. Welcome to Gusto. Ander: Thank you! You have a ‘shoes off’ policy here in your office. I have never seen that before and I absolutely love it. Jaleh: Yeah! This was just part of the way our founders were raised. Our first office at Gusto was at one of their homes so whenever someone would come over and they would come to work, they would have to take off their shoes. When we moved into an official office, they just kept that as a tradition. Now we have 400 employees. We’re still not wearing our shoes! Jaleh: Right! In San Francisco and in Denver. Ander: Awesome. And, from what I understand, you’ve been with Gusto for quite a while now. Jaleh: Yep. I joined a little bit over three years ago when we had 12-ish employees. Ander: At the time that you joined Gusto, how did you view marketing? How did you view what you were going to do when you came in here to tackle the interesting set of growth problems presented to you here at Gusto? Jaleh: When I joined Gusto, I actually joined it in a slightly different role. I was leading our API program and business development partner marketing. But, I was part of the business team that was responsible for a lot of our marketing efforts. You know, in a lot of ways in the early days we operated like a really scrappy growth team. Ander: What did you identify were those most cost-effective and quick ways to do so? Jaleh: Incubators were a really great channel for us. For example, we were a YC company ourselves and we would ask to be included in their events so we would send them materials. Every Incubator has community managers. If they believe that you have a product or service that‘s valuable for their users, they’ll often just let you get in front of their users at no additional cost. That was our primary go-to-market channel in the very, very early days. As we grew bigger, we expanded into the accountant channel. I’m a big believer in partner programs. Pretty much every product that you sell there has a group of influencers that are already working with the customers that you want to reach and they can introduce your product to them if it’s something that would solve a meaningful problem for them in a way that other products that are out there can’t. For us, that channel was the accountant channel. The majority of small businesses work with an accountant. Accountants recommend financial products to their customers and payroll is certainly one of those. We started getting a lot of traction from accountants actually reaching out to us and saying, ‘Oh, I’ve heard about Gusto from my client and I’m interested in potentially introducing it to other clients.’ Then we started getting into that a little bit more and talking to more and more accountants, trying to understand the market. We decided that this was going to be a really good channel for us and a really scalable program. Ander: It sounds like the discovery of accountants being the ones to help you break through the noise and get out there to the companies using your products was almost by accident. Or was there some more intention behind it? Jaleh: Yeah. That’s a good question. I’m not sure if it was entirely by accident or not. Ander: At the very least, if it was an accident, I’m sure it was a very nice surprise. Jaleh: Yeah, it was definitely a very nice surprise. Ander: And if it wasn’t, it was a very smart decision. Haha. Jaleh: Yeah. One really nice thing about payroll is that your accountant has to interact with the product. And so when you implement Gusto, even as a business owner, you end up adding the contact information of your accountant so your accountant then gets access to Gusto. Gusto, and the HR industry in general – anything that is related to payroll, anything that is related to benefits, whatever it might be – is in a very unique position. You have to keep the companies happy. You have to keep the accountants happy. But, as somebody who gets paid through Gusto myself, you also have to keep the employees happy, possibly getting them on board with switching over to Gusto without having any anxiety about where their paycheck is going to be coming from. How do you address that fairly unique problem? Jaleh: Yeah, it’s a great question and it surfaces itself in a different way, maybe, than the way you phrased it. Jaleh: You implement an HR product because you’re trying to take care of your employees, right? Jaleh: However, because HR products are sold to the business owner or the person responsible for HR, the employee over time is not considered as a stakeholder anymore by most HR companies. And sadly, the needs of the employee gets removed from the equation. This is the way that the HR industry has operated for a while. One of our founding principles when we started Gusto was that the employee is a very important and equal stakeholder. The whole purpose of an HR platform is to help take care of your people that are at the company and to empower them. Therefore we’ve designed Gusto to have a really great user experience for both the employee and the employer. I see the employee side as a huge growth channel for us. If we build a great experience for the employee and they consider our product indispensable, when they go to their next company they are recommending Gusto. It’s an audience that we’ve cared really passionately about from the beginning and even to this day they are a huge advocate group for Gusto. There are a lot of companies who discover Gusto because their employee recommended it. These growth loops are something that we think a lot about of how do you think about. Where does your product sit? And, don’t just think about your buyer. Who are the influencers or the folks that touch that product or need to interact with the product, and how can you give them an experience that’s really valuable and indispensable? Once you do that, then you can use those folks as a growth and referral channel for the company. Someone would buy Gusto and then their employees would get introduced to Gusto. These employees are now, when they leave their company, are recommending Gusto. On the accountant side, when someone uses Gusto they have to add their accountant to be able to get tax information from the product at the end of the year. And so we would add the accountant and invite them to Gusto. Now that accountant is aware of Gusto we can then nurture them and talk to them about the value of being part of our partner program. So, we spend the money to acquire one customer but then that customer has a much stronger viral coefficient because we tap into these influencer networks that are around them. Ander: That viral coefficient obviously is very important to how you view your growth and your marketing strategy overall. How do you amplify or maximize that viral coefficient? Is there an inbound content strategy to be engaged with the employees? Are you targeting employees who are paid through Gusto? Are you targeting them in ad campaigns? What are some of the ways that you attempt to do that? Jaleh: I think it all starts with earning the right to use someone as an advocate. Jaleh: Yeah. Haha. So if someone is not aware of you and you don’t solve a real problem for them, you can ask them over and over again to refer your product and they never will. Over time you’re just going to frustrate them and turn them off to your product and service. We always make sure we are creating a really great experience for this user and we measure that with NPS. We’re pretty religious about measuring that promoter score from the very early days. We measure it in every customer segment for all the different profiles of folks that use Gusto. In the early days, we would just send people emails and they would refer our product and we would manually manage it on the back end. We’ve gotten a lot more sophisticated. We built it into our product. If you log into Gusto, you could see your referral link and employees have this same referral link that they can use if they want to refer Gusto to anybody. We now enable companies to connect their contacts and we have embedded the referral flow into a few different interaction points. We constantly test to make sure that it is relevant for the user, it’s not too intrusive, and that it shows up at a moment where you would be interested in potentially taking the time to refer Gusto to somebody else. Ander: That’s really interesting and I want to come back to that in a little bit. But there’s something that I’m seeing out of the window of this conference room we’re here in right now and you’ve been here since 2013, quite a long time. You’ve gotten to experience how Gusto has really grown into, you know, 400 employees as you said earlier. And when we talked on the phone earlier this week, one of the things that you mentioned you’d like to talk about is marketing leadership. Ander: As a marketing leader within an organization, how you adjust to that kind of growth within your organization and how has that affected you as a leader and how you see you role here at Gusto? Jaleh: Yeah, it’s a great question. One of the biggest assets that I think Gusto has is our culture. Jaleh: Haha. That’s part of it. Jaleh: I would owe our culture to kind of a few different things that we have done. We were very specific about what are our values as a company. When Josh, Tomer, and Eddie created the company, they said, ‘What are our values as people? And those are going to be the values of our company. And when we interview folks and bring additional folks to the company, we’re going to make sure that they are aligned with these same values.’ You can’t really teach values, you can’t change them. You have them. So that was a big part of our hiring and interview process. A lot of our policies are designed around those same values, for instance, transparency, and being a builder, and thinking in a scrappy way, being an owner, etc. As we have grown, we have very deliberately invested in culture. We’re known to have a pretty intense interview process and a big part of that is not just the skills but making sure that the person is aligned with the mission and with what we’re trying to do at Gusto and that it’s something that they genuinely care about as a person. To me, a lot the role of our leadership team is to embody those values and to be a good role model to everybody else on the team. I think specifically when it comes to scaling Gusto and the marketing team, you know, I took on the marketing team about a year and a half ago. At that point it was just a little bit over ten people. And we’re now around thirty. You know, one of the things that I find that I’ve really invested in with the team that I think is really important for marketers is investing in the core skills that makes you successful at acquisition in today’s world. And for me, my marketing philosophy is the same as my business philosophy. In a highly competitive market you have to be right about important things that others are wrong about. And the way to do that is you have to be incredibly creative and you have to be first principles, data-driven thinkers. If you just do the same thing that everyone else is doing, it’s really hard to break through the noise and stand out, right? You go to every website, and everyone’s just saying the same thing. You can imagine how hard it is to break through. And then first principles thinkers because you have to make sure that you’re solving the right problems. I’ll give you an example maybe that kind of helps bring these things together. Those two things are very different and I don’t think the solution to either one of those – the best possible solution – would be a better forum. You might take a very different path if you identify the problem more effectively. Those two skills of creativity and first principles problem solving are two things that we spend a lot of time as a team training folks and helping them understand, ‘Ok, let’s take a look at this proposed solution here. How can we improve it?’ We’re constantly investing in those skills for the team. I think those are more important than any specific technical skill in marketing. With everything you’re talking about in terms of creating evangelists out of the employees who are getting paid through Gusto, reaching out to these accountants and working with these influencers, how does paid acquisition fit into you strategy? Jaleh: Yeah, absolutely. Paid acquisition is an important part of our strategy but it leads to relatively small portion our customers. It’s interesting because we have an unlimited budget on paid, meaning as long as it’s cost-effective we don’t arbitrarily cap the budget. Most companies that have the luxury of having VC funding tend to operate in that way. With that, why is it that paid acquisition ends up being a small portion of our overall customer acquisition mix? It’s because it gets really hard to scale paid acquisition. As you keep growing, you have to expand and go to channels that become less and less cost-effective. For example, we use the See-Think-Do-Care funnel view. ‘See’ is your total addressable market. These are all the folks, for example, who are a good fit for our payroll product. They’re within our employee account, they’re the right company size, etc. ‘Think’ is the percentage of those folks who are maybe thinking about changing their payroll product. ‘Do’ is the very small percentage of those folks who are actually looking for a new payroll product. And when you want to invest in paid advertising you obviously start with the bottom of the funnel and you go to the top, and so often you will find really good success in the ‘Do’ bucket, right? These are the folks who are going into Google and putting in ‘payroll software for startups’ or ‘small businesses’ or whatever it is. With some optimization you can usually make that channel really cost-effective and start to expand your key words and that becomes a really good channel for you. However, you run out of that inventory and so as you start to scale, you now have to go up the funnel to folks who are perhaps not ready to make a switch. They probably don’t know who you are and you have to get them to know you and become intrigued enough by you to cause a re-evaluation and to get them interested, and then engage with you by signing up as a lead and becoming a customer. At some point that process kind of breaks down. You can keep improving it by doing a lot of testing and really improving your conversion rate. But typically, depending on what the unique economics of your business are, the cost of acquiring that colder and colder customer becomes prohibitive. Even though you have an unlimited budget you can’t make it cost-effective, therefore a lot of channels that are available and have a lot of inventory will become inaccessible to you. The best thing you can do is continue testing. Obviously as your company grows and more and more folks become aware of your product, you’ll see a lift in the paid channels as well for sure. But generally speaking, I definitely don’t recommend having anything more than 50% of your direct acquisition budget be spent on paid. If you can make it work cost-effectively, more power to you. But I’ve almost never really seen that work. So partner and organic need to be huge areas of investment, I think, especially if you’re serving small businesses, a low ACV kind of a customer. Ander: Excellent and actionable advice. I totally agree with that and totally understand what you’re saying. As this relates to everything we’ve spoken about, including earning the right to actually work with those influencers, to speak to those audiences, maintaining that level of creativity as you scale your team, and some of the unique challenges that have faced companies like Gusto in the HR industry, where do you see all of this going in the future? If we look at marketing, if we look at what you do, how is this going to change in the next few years and how can marketers get ready for it? Jaleh: Yeah, yeah… You know, I’m an engineer, right? And so you can imagine what camp of marketers I’m in. Ander: Our head of marketing is actually also an engineer. Jaleh: Haha. Yeah. So, I started in a very data-driven way. You form a hypothesis, you run an A/B test, and whatever those results are inform what you do and what you implement. Over my time here at Gusto, I have come around on brand much more so than I had anticipated. Brand is interesting because brand has a really bad rap among the new marketers. Ander: The very quantitative marketers. Jaleh: Yeah, the very quantitative marketers like us. And, when you hear ‘brand’ you immediately think billboards and spending millions of dollars without being able to prove ROI. My definition of ‘brand’ is essentially the sum of the interactions that your customer has with your company. A good brand just means that you have customers who love you, who can’t live without your product, and who are advocating for you. They have this emotional connection with your brand. You actually can measure that. You can measure NPS and you can measure your word of mouth and virality. So, when we design our customer interactions, we’re always asking how we can do this in a way that forms an emotional connection with our customer and showing them that we care about them, that we appreciate them, we understand them, and that we’re really on their side. Now I care a lot more about things like our brand personality and how we are showing our love towards our customers. Ander: You have to tug on the heartstrings. Jaleh: Haha. Right. Exactly. And, how do we make sure that this is consistent across all of our interactions? When you design from there, you can use data to measure the effectiveness. Is our brand resonating? Do people feel a connection to the company? Are we inspiring that loyalty or not? I would say I’ve become, in some ways, and I would consider a much more well-rounded marketer in that you understand the value of the brand but you’re still data-driven, and you’re applying those same principles to the brand side of the house. It’s been a great development for me. Ander: That’s awesome. Love hearing the personal stories, especially from people who are working with such cool organizations like this. One final question for you Jaleh. What is something that we as marketer can do to make marketing better? Maybe it’s making the marketing community better as a whole, or to help out Gusto. To me, marketing is one of the hardest functions in a company to build because you need your quant side, you need the qualitative side, and your creative brand side. I think being clear about what the role of marketing is is really important. A lot of time when people hear ‘marketing’ they just assume it means you generate leads. I think good marketing teams should be influencing a lot more than that. You should be thinking holistically about the funnel. We define our mission here as, ‘Help our customers discover, adopt, and evangelize for Gusto,’ which means that marketing is involved at every stage of the funnel, all the way from becoming aware of us to evaluating us to using the product to then later buying additional products from Gusto and driving evangelism for Gusto. I think when you define marketing in that way, and incentivize your team to be excited about revenue and the short- and long-term growth of the company, that’s when marketing can earn a much bigger seat at the table and be part of setting the strategy of the company. Ander: Awesome. Jaleh, it was excellent being here, coming to your office. You’re right around the corner from us here in San Francisco, just south of Market Street. And it’s been a pleasure being here. Jaleh: It’s been great to have you. Ander: Yeah, for sure. Once again, thanks for coming on the show and I’m sure we’ll talk to you soon.